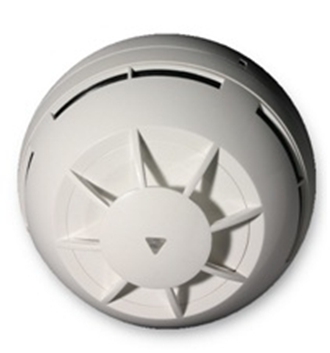 The HyFire Intelligent Wireless Heat Detector is one of three variants offered by HyFire. 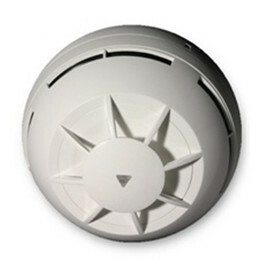 All of HyFire's detectors are compatible with the loop Translator Modules and Expander Modules. Each detector is powered by dual 3v lithium batteries. The condition of both batteries are monitored by the translator module, which reports back any discharge or faults with the supply, faults can also be identified by an internal LED indicator. In addition to this the indicator supplies a visual representation of signal strength during the programming to aid the ability to define stable operating locations. The patented design of the smoke chamber ensure sensitivity from all directions whilst protecting the chamber from airborne contamination and background illumination. Each detector is fitted with a reed switch to allow testing using a magnet. Time Period Between Wireless Signal Transmissions: From 12 sec. to 2 min.